The title blurs a lot, so it’s difficult to capture in a single image. Voodoo gets a bad rap in movies. Even in a film like Sugar Hill , in which voodoo is the means of taking down a gangster, it’s presented not so much as a religion as it is a dangerous and barely controllable weapon. It was therefore no surprise to me when Jessabelle turned out to be yet another in a long line of bayou stories in which voodoo is a menace to nice white people. 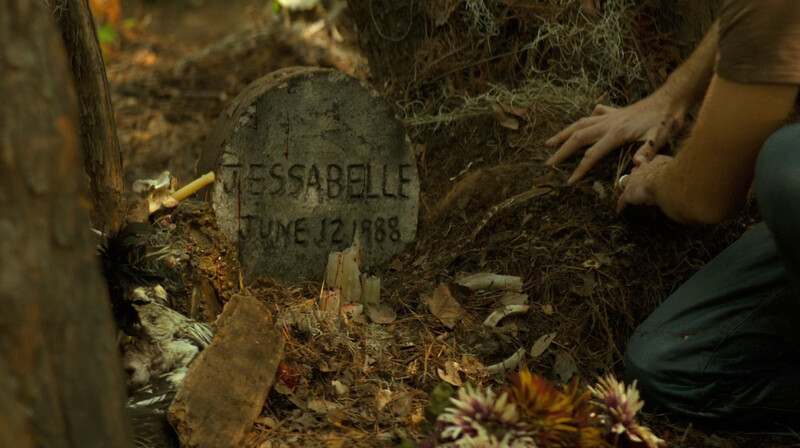 A grave marked with Jessabelle’s birthday. While being thematically lazy is a strike against Jessabelle , it recovers a lot with its heroine Jessabelle Laurent (Sarah Snook). Jessie is damaged in body and spirit. She never really knew her mother, who died young from cancer. Her father gave her to his sister to raise. As soon as she could get into college, Jessie left town and never looked back — until an accident killed her boyfriend and ended her pregnancy. With nowhere else to go to convalesce until her legs heal, her father grudgingly takes her in, opening up his wife’s sick room for Jessie’s use. Jessie is alone, unwanted and unloved except for her married, high-school boyfriend. She’s depressed, and she’s going to find out just how much more can be lost before she is herself gone. As much resolve and determination as she shows, Jessie is clutching at straws. She started drowning from the time of the car crash, and she spends the entire movie trying to surface for air. Jessie spends an uncomfortable night on the couch of her ex-boyfriend. There are secrets in her father’s house, as there so often are in decrepit estates, and they are horrific. 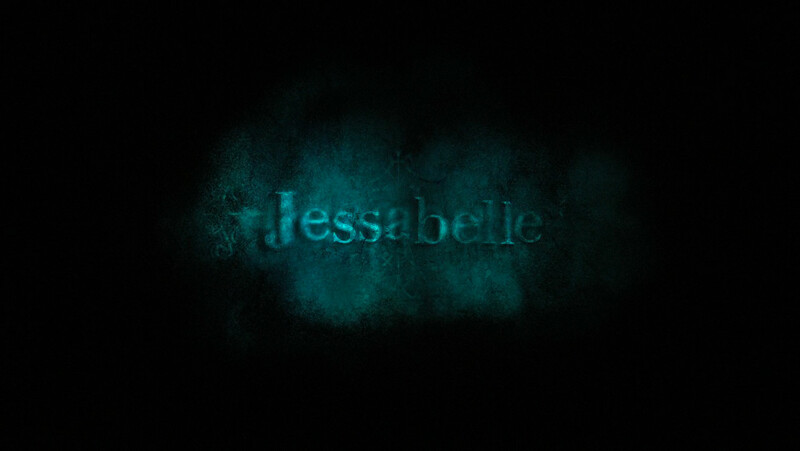 Jessabelle is a gothic horror of mood and identity cloaked in the trappings of voodoo vengeance. A lot of horror movies present visceral trauma to engage and repel the audience; even if you feel no empathy for the character, you can connect with the thought of physical harm. While this film certainly uses physicality (ghosts are neither silent nor immaterial here), the greatest threat is purely mental. It’s the existential terror of lying awake in bed at 3:00 AM, when you fear that your life isn’t just a lie but that it doesn’t make any difference. Jessie sees a ghost in the reflection of a cloudy old mirror. Jessabelle does a creditable job at establishing Jessie’s character and building the requisite dread. I credit Robert Ben Garant with crafting the script in a way that emphasized Jessie as a person and not another interchangeable victim. I’m more familiar with Garant for Viva Variety and Night in the Museum , so while I didn’t doubt that he could write comedy I had no expectation that he could pull off a largely psychological horror. Now I do. As a director, Kevin Greutert is a pretty good editor. I’m not sure that working on films in the Saw franchise prepared him for directing a character-driven horror, but it does perhaps explain the few moments of gooey imagery. Jessabelle’s mother left tapes for her to watch. The heavy lifting is done by Snook. She portrays Jessie’s flailing attempts to regain control as a journey through fear into a genuine urge to help the dead. That what they want is her destruction is the final betrayal in a life that was always destined to be short. There’s a bewilderment in Snook’s performance, no matter how resolute or terrified Jessie is, and it conveys the film’s unanswerable question: why her? Like most tragedy in life, we can only shrug and mumble about fate. Snook delivers the last line of the film perfectly, and ultimately it’s the only thing that matters to Jessabelle.